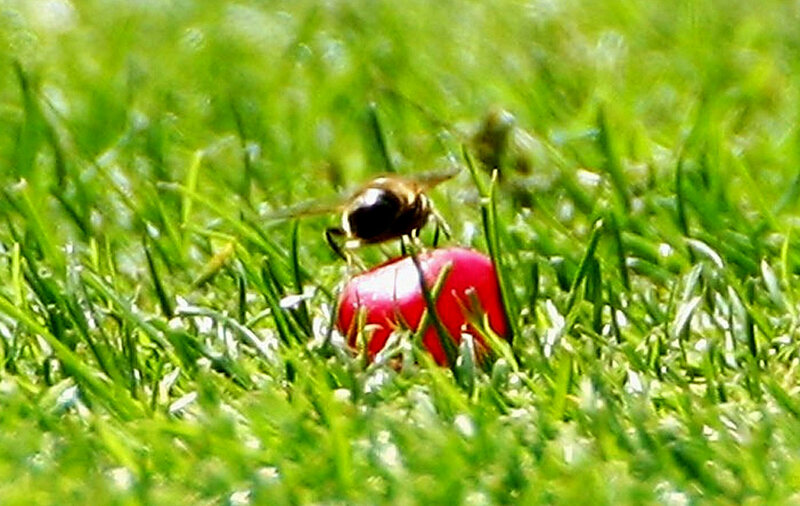 It was the second half of the English summer, and The Oval had always been kind to spinners. The Indians would have loved to bat first but Ajit Wadekar lost the toss and Ray Illingworth batted first. England were all out for 355 on the first day. The second was washed out. At the end of day three, India were 234 for 7, and on the fourth morning, their innings ended at 284. 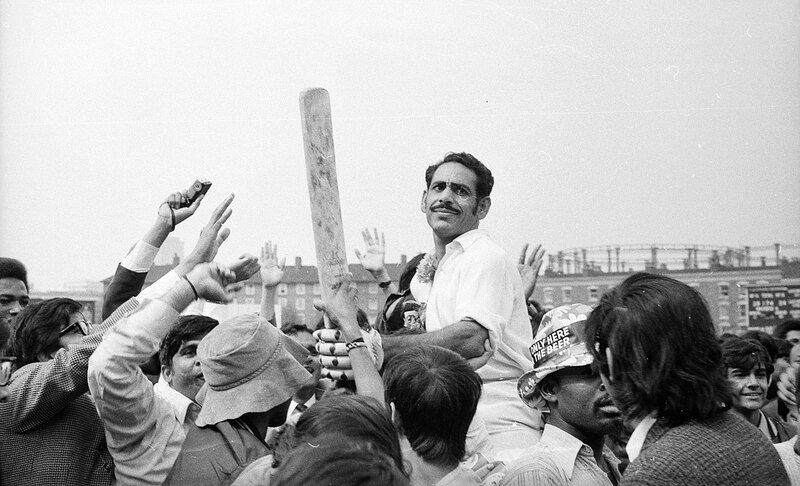 England began their second innings shortly before lunch and a tsunami hit the Oval, in the form of a tall, thin, long-haired, full-sleeved destroyer: Bhagwath Subramanya Chandrasekhar. England all out 101, Chandra 18.1 overs, 6 for 38. It was just past 4pm and India had the rest of the afternoon and all of the next day to score 173 to record their first win in England. The fifth day was a Tuesday but it was a holiday in India, for Ganesh Chaturthi. The match finished a little after lunch in England. As Abid Ali cut the ball to the boundary for the winning runs, Brian Johnston, his voice fruity as ever, told us that India had won. The team were received like kings at Bombay's Santa Cruz airport, submerged in garlands of marigolds, travelling in a cavalcade that took hours because thousands of fans had come to greet them. For weeks after, cinema-goers in India were treated to visuals of this reception in the newsreel that preceded the screening of films. The audiences in the cinemas would spontaneously stand and clap as the cricketing heroes came up on the screen. It was an unforgettable time in India's sports history. At tea on the final day, with the Oval bathed in sunshine, India had got to 304 for 1, with only 134 more runs needed, and enough overs and time in hand. Journalist Rajan Bala, an insider, later revealed: "Victory was what was being discussed in the dressing room throughout the day. By tea-time everybody was tense. The time had come to strike." India's captain, Srinivas Venkataraghavan, remembers every minute of that day. "When the fourth innings started, we weren't thinking victory, but when the first wicket put on 200, we knew there was a chance. What had seemed impossible appeared real." Sunil Gavaskar made the double-century of his life - not one false stroke, not beaten once, breathtaking drives and delectable shots off his legs in the arc between mid-on and square leg. Word had spread that India were set to make history and the crowd had swelled in anticipation. But not every tale of valour ends happily. India's charge at the mammoth target of 438 was heroic, but they stumbled in the final overs. With just 72 to get in 12 overs, and eight wickets in hand, Venkat promoted Kapil Dev. Just 20 and callow, Kapil holed out for zero. India soon subsided to 423 for 8 and the match was called off as a draw with nine required off the last ball. Kapil and Lord's, Dilip Vengsarkar and Lord's - the connections will always be special. 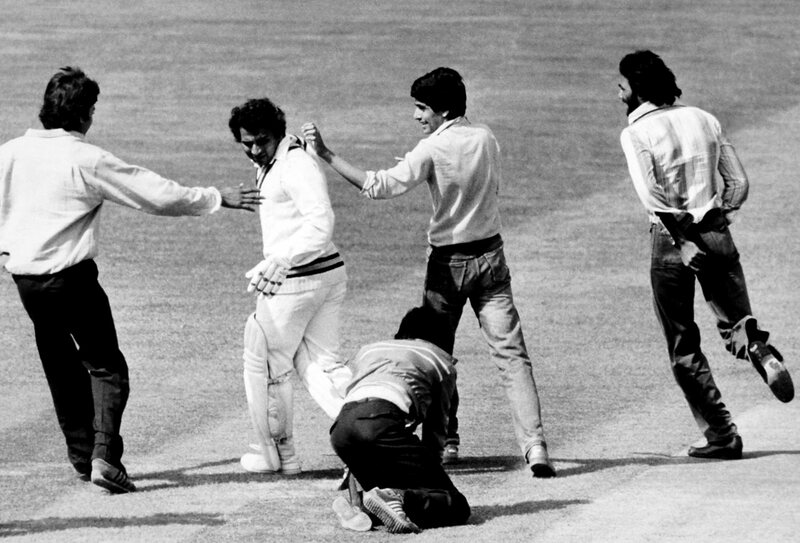 Kapil and his team gave Indian cricket its happiest moment at Lord's in June 1983, when they lifted the World Cup. Now, three years later, he led India to their first-ever Test win at Lord's. Vengsarkar once said he would have liked to take the Lord's pitch wherever he went. 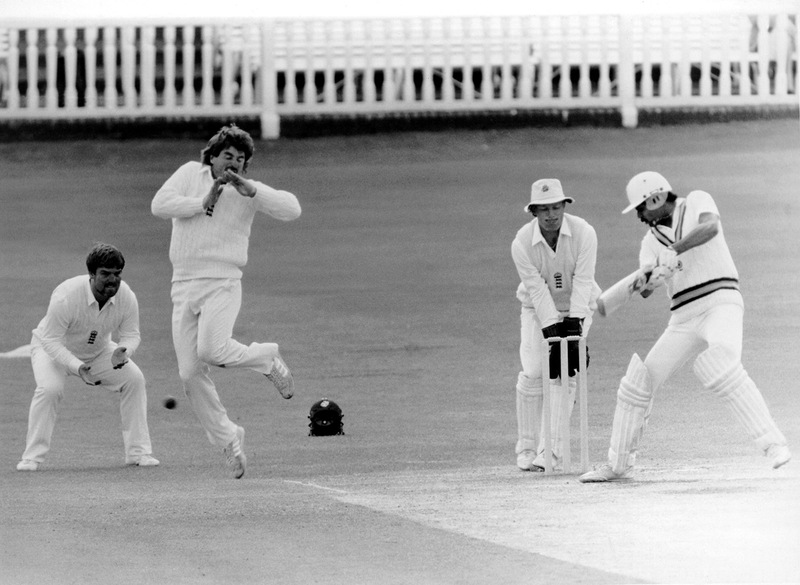 On his first visit, in 1979, he hit a match-saving century; in 1982, he repeated the feat. Now in June 1986, he scored a match-winning hundred on his third visit, a feat no overseas batsman - not Bradman, Sobers, Richards or Chappell - has ever equalled. At his best, Vengsarkar combined majesty and serenity, attack and defence, marvellously. Between 1985 and 1988, he had such a golden run that he was considered one of the best batsmen in the world. A match that would have chugged to a draw was stirred to life by a superb spell of fast bowling by Kapil, going up the slope from the pavilion end. He consumed England's top three in 19 balls, giving just one run. It was a match-winning spell. England folded for 180. On the last day, India needed 134 to win and romped home by five wickets. Fittingly, out came the captain to finish the match, smashing four boundaries and a six over midwicket. In the next match, in Leeds, India thumped England by 279 runs, sealing an emphatic 2-0 series win. If we were to choose one Test that was a decisive inflection point in India's ascent to the top of world cricket, it would be this one. On a green top, in conditions tailor-made for the home team's seam bowlers, India batted first, put up a large total, and then took 20 wickets using the conditions better than their opponents. From Headingley on, India began to win abroad more regularly: four out of every ten Tests in the next eight years. The Indians had made up their minds to bat first if they won the toss, put up a score, play two spinners, and beat England with spin in the fourth innings. When they batted, under overcast skies on a damp, greenish pitch, they demonstrated the virtues of concentration, determination and confidence in their technique. When it was their turn to bowl, they showed a fine awareness of length and line, and benefited from the balance of their attack and its unflagging concentration. They beat England by an innings and 46 runs in their own backyard, and remarkably, won virtually every session in the match. India's coach, John Wright, noting that it was their first Test win in England since 1986, called it India's best overseas victory ever. Years later Anil Kumble said, "It ignited a spark in us that we could perform away from home." 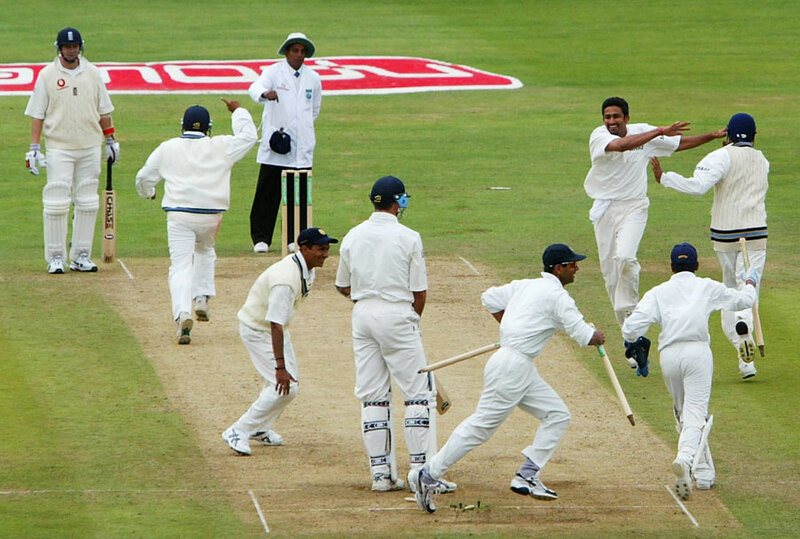 Five years before, in Leeds, on a green top in swinging conditions, India batted first to make a statement about their batting, and won. Here in Nottingham, they sent England in. Rahul Dravid's bowlers did not let him down. There was both industry and intelligence in their work. England were bowled out for 198 in less than 66 overs. Would they drive home the advantage? The question was answered emphatically when they posted 481. The third evening was all about the jelly beans incident. India's lead had crossed 250, England had bowled over 155 overs, and their fielders were dispirited when they played a juvenile prank, tossing jelly beans on the pitch while Zaheer Khan batted. Trailing by 283, England had 16 overs to negotiate that evening, but more importantly, they faced a riled-up Zaheer. The next day, Michael Vaughan led the way with a magnificent century, but England collapsed from a sturdy 287 for 3, losing their last seven wickets for 68 runs. India knocked off the target with ease. There could be no claimant other than the magnificent Zaheer for Man-of-the-Match. It was a happy tour, and Dravid stepped down as captain at the end of it, with the satisfaction of a victory. The pain of the World Cup elimination earlier that year was dulled.